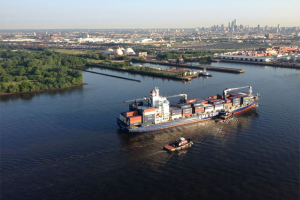 The Port of Philadelphia is in the process of deepening from 40’ to 45’ the main channel of the Delaware River from the ocean to the marine terminals in Philadelphia and Camden. The project is 95% complete. The deeper channel will be beneficial to both Pennsylvania and New Jersey. In Pennsylvania, the Packer Avenue Marine Terminal, Piers 78, 80, 82, 84, 96, 122, & 124, Penn Terminals, the Aker Philadelphia Shipyard at the Philadelphia Naval Business Center, and the oil and gas refineries, will all benefit from a deeper navigation channel. In New Jersey, Beckett Street and Broadway Terminals, the Ocean Marine Terminal in Gloucester City, and the oil and gas refineries will also benefit from a deeper navigation channel.